So, where are you from? – oh, you are Russian? No wait, you don’t have an accent… Oh you are American too? 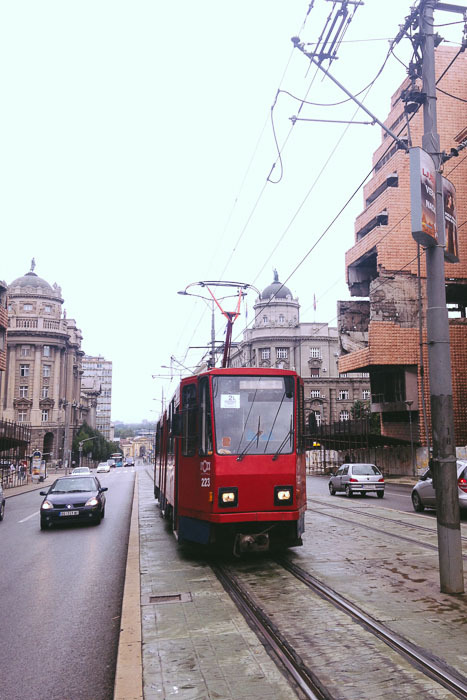 But within 5 minutes of being in Belgrade, the city forcefully, gut-wrenchingly forces you to unearth those long buried tensions, that one big nagging question – so which side are you on? And if you aren’t picking sides, well then, are you a hypocrite? When it’s fun and games you are a Russian, when it’s all rosy and everyone loves your country you are an American… so what now? Moments after walking out of the main train station we had to stop and compose ourselves. Right in front of us, in the city center stood (or rather towered) the remnants of the former Yugoslavia’s Defense Ministry bombed during NATO air strikes in 1999. The carcass of the building spans a four-line center city main thoroughfare. 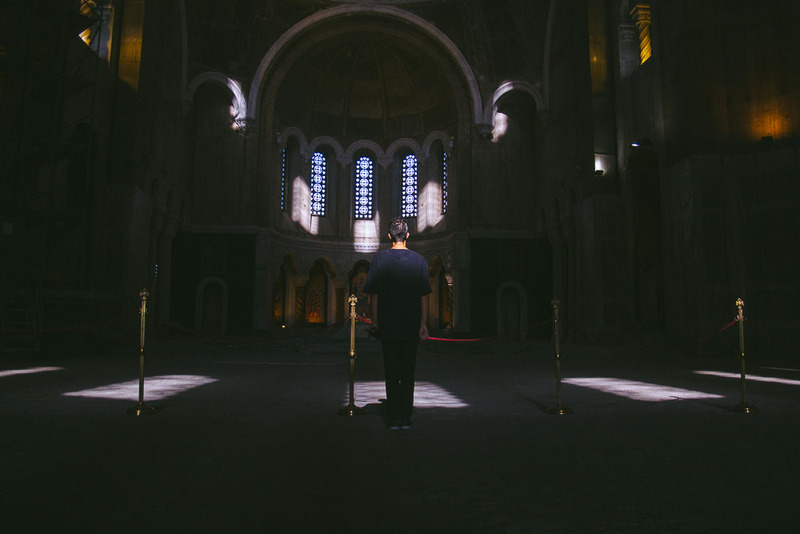 It is imposing, scary, and omnipresent. 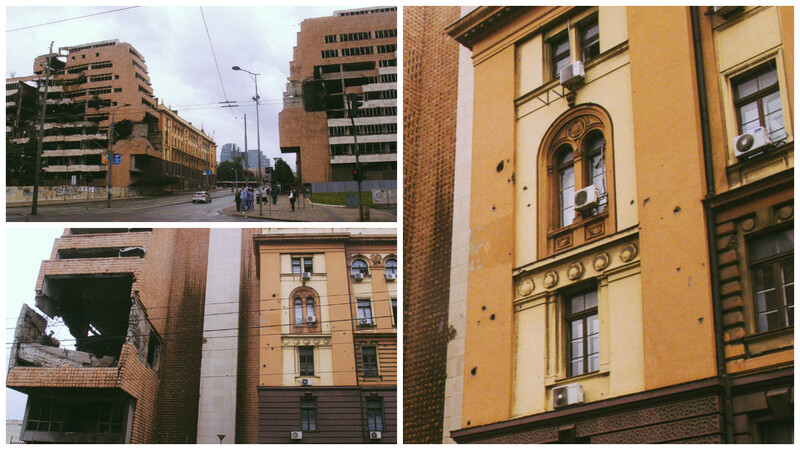 After a few moments we saw the pot marks on surrounding buildings — more scars from the bombs that fell on Belgrade for several months. We hadn’t read up on Belgrade too much, and didn’t expect this graphic reminder from our childhood past. Television images of the war flashed in our minds – for me from the US, for Sergey from Russia. 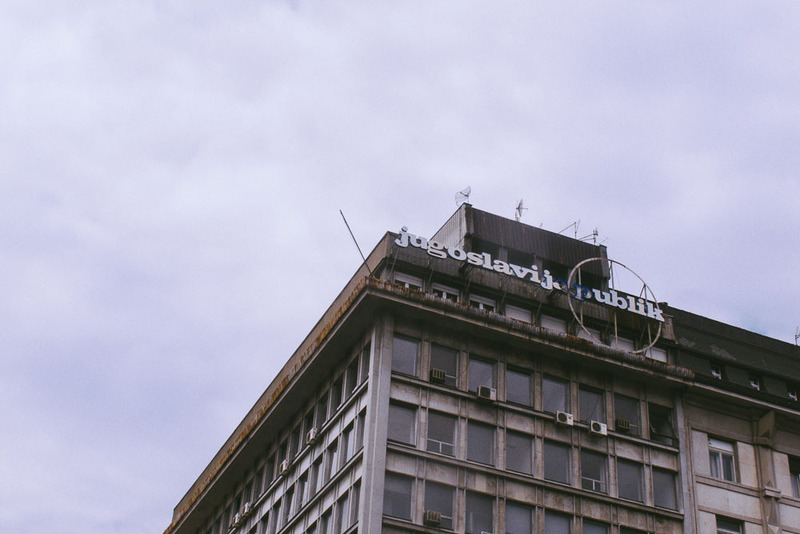 Former Ministry of Defense of Yugoslavia, Belgrade, Serbia. The painful civil wars, which lasted for several years and tore apart Yugoslavia into five different states, are perceived and told very differently in Russia and the US. Without going into many historical details and nuances, NATO bombing campaign is still viewed in Russia as an illegal breach of international law and an attack on brotherly Slavic, Orthodox sovereign state. The main culprit behind the NATO campaign, is of course the US. Meanwhile, in America that same campaign was a virtuous, almost humanitarian Allied mission to stop genocide, horrific human rights violations and war crimes. At that specific moment, we didn’t quite process the image and all of the reminders about the past, before a second shock to the system hit us. 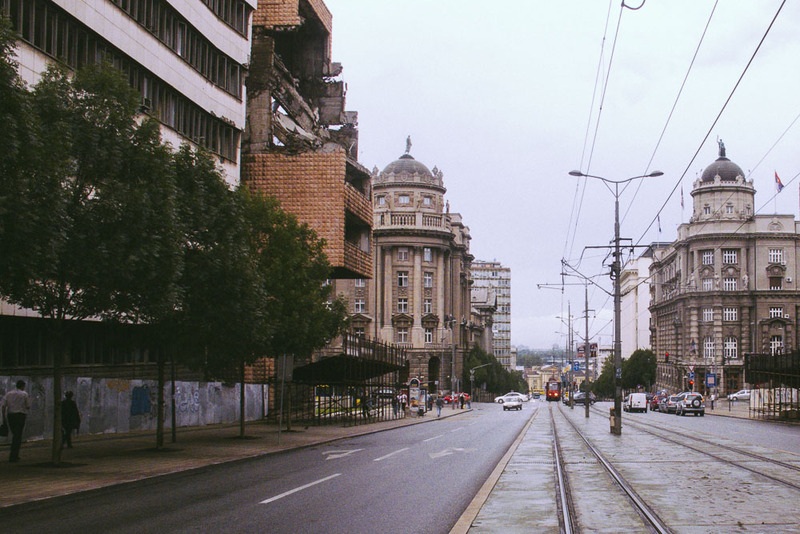 After we composed ourselves and moved on from the bombed out former military headquarters of Yugoslavia, we walked over to the tram station just a few short blocks up. Almost immediately, a man approached us and started to vigorously shake Sergey’s hand. Russian brother and sister – welcome! (I am not kidding or exaggerating). He proceeded to tell us in a mixture of Serbian and Russian (the two languages share common Slavic roots akin to the Romance roots of Spanish and French languages) that we didn’t need to purchase tram tickets, and we should just tell the driver that we are VIP guests from Russia. We were even more perplexed after boarding the tram (with tickets) and seeing images of Russian president Vladimir Putin in full military get up plastered in apparent propaganda of Slavic nation. While not exactly comfortable with the messages, we felt welcome and quite at ease in our Russian identity. Minutes later, having arrived at our couch surfing host’s house, we sat drinking wine in the kitchen sharing stories about growing up in Russia, coming of age in the US, and the violent breakup of Tito’s communism and life in Serbia today. A reminder from Yugoslavia’s past in Belgrade, Serbia today. She told us of growing up with parents who were mid-level professionals in the government administration of Yugoslavia, who like many others wholeheartedly believed and supported Tito and his vision. She told us of the disbelief that came with first shots of the war, the economic devastation – her parents had to borrow money form her piggy bank to buy necessities, the rampant inflation – the bi-weekly salary had to be spent within 24 hours of getting paid otherwise it would become worthless. 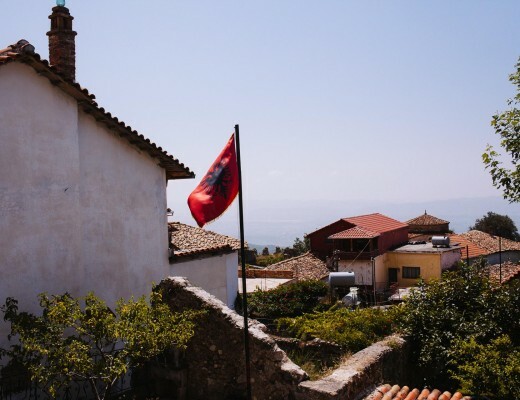 She told us of how her parents sent both her and her sister abroad to study, encouraging them to figure out a way to stay as there was little clarity on what would become of Yugoslavia. Today, she’s a young professional but like many others unemployed and still unsure of the future in Serbia. Unlike the man who approached us at the tram stop, she doesn’t associate any good feelings with Vladimir Putin or today’s Russia. She doesn’t peak Russian, but is fluent in English. She’s ambivalent about Tito, and decidedly less so on Slobodan Milosevic. She definitely sees Serbia’s future in the EU, despite the cultural and linguistic ties with Russia. She clearly identified us as Americans, and was much more interested in that part of our heritage. So we told her about immigrating to the US, coming of age in the culture of high school and driving at the age of 16, about that time we suddenly realized that we were, in fact, American, just as much if not more so than Russian (it happens — but it takes awhile!) But throughout that lovely evening – which featured many childhood memories that were much happier, the ballads by Serbian singer, and lots of wine — we couldn’t shake a feeling of guilt – for being Russian or for for being American….maybe for being both? a double whammy. And guilty for what? We certainly never have been close to making decisions at the state level that involved thousands of lives at stake, we were children at that time anyway. 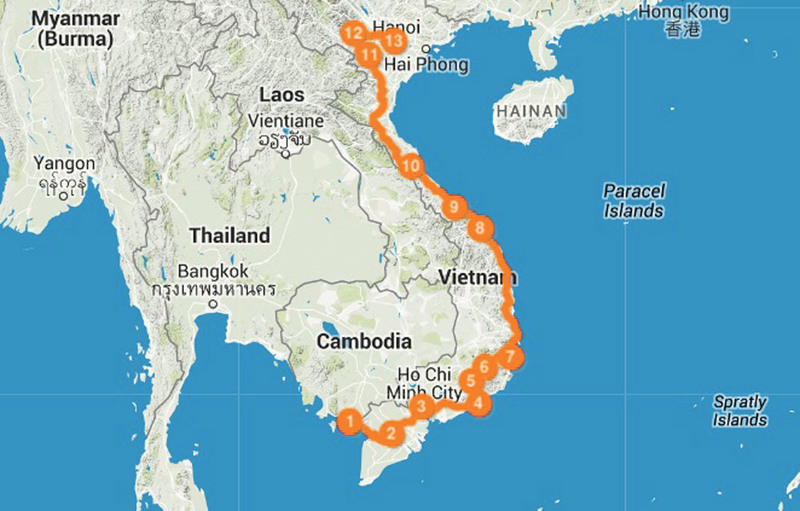 Is it guilt by association — like the one we felt in Laos and Vietnam? Or was it because of the warm reception that we had received hours earlier, merely for being Russian…only to have switched our identity hats to now being Americans? Likely, all of it. So, who is right? Which side are we on? Are we total hypocrites? Well, if you want to come over for some vodka and pickles we can talk late into the night, as Russians are want to do for just about any occasion, and for this particular instance there will be so many nuances of the argument; I doubt we will be finished by dawn.